'Changing the Economic Vector': Will Italy Leave EU Amid Budget Row With EC? The European Commission has rejected Italy's proposed budget for 2019, saying that Rome's overspending represents "an unprecedented breach of EU rules" and pledging sanctions in response. Sputnik looks into possible repercussions from the move. Earlier, Italian Deputy Prime Minister and Interior Minister Matteo Salvini stressed that Rome will not give up its plan to increase the country's budget deficit for 2019 to 2.4 percent of the GDP compared to a 1.6-percent deficit set by the previous government, even if Rome's plan is not accepted by the European Commission. Contributor Alexander Lesnykh wrote in his article for Sputnik that Salvini's remarks mean that "the new Italian government, formed in the middle of this year, has changed the economic vector." He recalled that back in June, the leaders of the current ruling parties, Lega Party and the Five Star Movement, promised that they will scrap the old European policy of fiscal prudence and that "Italy would start spending money for the sake of its future." Last week, the European Commission slammed Italy's proposed budget for 2019, worth a whopping 37 billion euros, as an unprecedented breach of EU rules. "However, Italy is not the only European country with a state budget deficit that goes beyond the established framework," Lesnykh noted, citing France, Spain and Portugal. "If [Italian Prime Minister Giuseppe] Conte decides to go the whole way, Rome is very likely to demand debt restructuring from the European Central Bank. If this is not fulfilled, Rome may declare a default and start the process of leaving the EU," Lesnykh pointed out. He explained that even though this scenario looks unlikely, many experts believe that the Italian government has a wide range of reasons for taking such drastic steps. "First, Rome finally realized the fact that the economic policy imposed by Brussels on the Italian government only leads to an increase in public debt and unemployment. Secondly, the EU sanctions against Russia hit the economy of the southern European countries without giving anything in return," Lesnykh noted. He added that against the backdrop of the most serious recent crisis in Rome-Brussels relations, senior Italian officials "are trying to restore interaction with Russia as quickly as possible." In this context, Lesnykh quoted Salvini as saying during a gathering of the General Confederation of Italian Industry in Moscow that "the fact that I came here on Wednesday afternoon is not normal." The Italian Deputy Prime Minister added that he visited Moscow because he was convinced that the [anti-Russian] "sanctions are economic, public and political insanity." He pledged to do his best to return as many Italian companies to the Russian market as possible, voicing hope that someday "the sanctions regime will end." Lesnykh noted in this vein that analysts believe that Salvini's arrival in Moscow lays the groundwork for the visit of Prime Minister Conte, who will meet Russian President Vladimir Putin in the Kremlin on October 24, when issues of bilateral cooperation will be high on the agenda. "Also, the two leaders will likely discuss the abolition of anti-Russian sanctions," Lesnykh added, referring to Salvini hinting that the economic interests of Russia and Italy coincide. 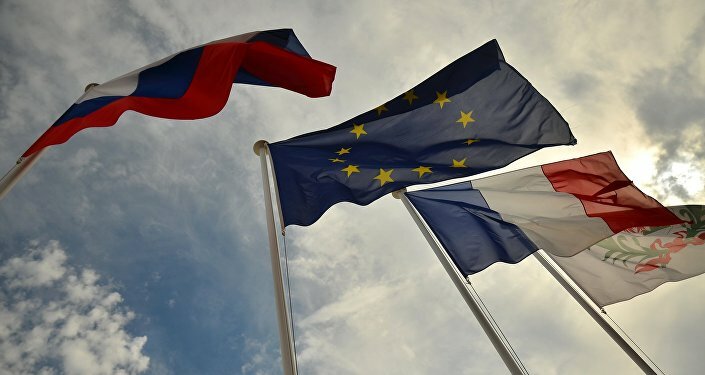 Lesnykh concluded by pointing out that given the fact that neither France nor Spain and Portugal were ever punished for violations of the EC's budget recommendations, "the government of Prime Minister Conte has decided to join the camp of violators." "And while Conte's rhetoric remains within the framework of a 'constructive dialogue' with Brussels, his deputy Matteo Salvini, has a ready wit and promises that the government will not give up its budget option 'despite the position of rating agencies and the EC's warning," he pointed out.